Here is a brief overview of the defining products of the industry-leading manufacturers whose products we proudly carry. For quick, safe, versatile, and energy efficient heating for any space outdoors, Infratech’s electric infrared heaters are an excellent choice. This company specializes in one of the most practical and efficient methods of heating any space, infrared heaters. They build an electric powered rectangular box-type patio heaters that come in a wide range of sizes, styles, and capabilities. These advanced electric heaters come with an array of control options from simple on/off toggle switches, to full-featured control systems. They can be set to respond to ambient temperature like any thermostat would do, turning on and off at your preselected temperature. With no fire, flame, or exposed heating element, there is a very low risk of fire, personal injury, or property damage. The exterior of these heaters remains cool even after many hours of operation. Infratech’s infrared heaters boast 90% efficiency and better. They allow you to bring indoor comfort to outdoor living. Their products come in a range of different finishes, styles and mounting options. Buyers have the option of choosing freestanding models or heaters that mount discretely anywhere in the home. Freestanding models are light and can be moved about easily, and all of Infratech’s products are stylishly crafted to work well in a wide variety of interior décors. Infratech heaters are available via a number of specialty retailers. 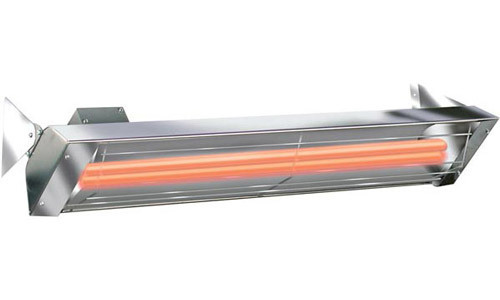 Manufactured by the Infrared Dynamics company, the Sunpak line of infrared heaters offers unique mounted infrared heaters. Infrared heating is a highly practical and efficient method of heating any space. Sunpak’s natural gas or liquid propane-powered heaters are rectangular box-type patio heaters and come in a wide range of sizes, styles, and capabilities. Buyers also have a scope of options to choose from. The Sunpak series has taken the revolutionary concept of the infrared heater and transformed it with natural gas and liquid propane power sources. Take advantage of either single or two-stage output, and control your heater using either wireless wall control or hardwired control. These heaters come in a wide range of sizes with a selection of BTU outputs to suit a given space or application. Every heater they make is CSA Design Certified and equipped for safe, clean burning. These highly efficient natural gas and propane powered heaters are among the most cost-effective heating options for any home, business, or other application. Sunpak heaters are only available in California, Nevada, Arizona, Oregon, and Washington. The Patio Comfort line of mushroom type outdoor heaters has been serving the outdoor “alfresco” heating industry for nearly half a century. These handsome and out of the way heaters deliver strong and reliable heat that radiates through an outdoor space for maximum comfort without getting in the way. Over the years, circular mushroom type patio and outdoor heaters have become a staple for restaurants, sidewalk cafes, and other outdoor service venues. They are a great way to warm guests as they arrive and keep them cozy in any space. Don’t stop enjoying the night sky just because it’s cold. These unique heaters create minimum light pollution as they do their job, enabling you to get the most out of your outdoor experience. These immensely practical outdoor heaters provide efficient infrared heating that is immune to gusts of wind. The infrared heating element feels as natural as the sun. It works, not by emitting heated air. Rather it uses infrared waves to heat objects and bodies directly. That means nothing is lost by using them outdoors. Patio Comfort heaters are powered by natural gas or propane. Natural gas models are mounted to the floor where they tap directly into the gas line. Propane mushroom heaters come with a sturdy base with wheels and can be moved to suit the user’s needs. Patio Comfort heaters are available via authorized independent dealers. Sunglo has been a leader in the space heating industry since 1967. These powerful, feature rich, and flexible space heaters cover a wide range of use cases with strong, reliable heat. 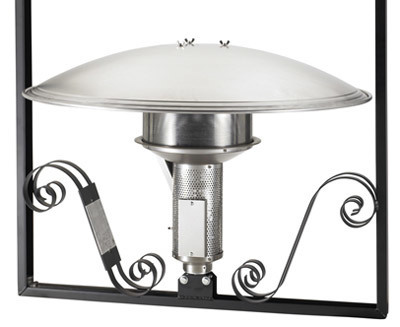 Versatile, powerful, and efficient; Sunglo’s circular mushroom style patio heaters are powered by natural gas or liquid propane. The Sunglo line of heaters offers a wide range of capabilities. The natural gas version is ordinarily mounted to the floor where they tap directly into a natural gas line. However, the Sunglo natural gas mushroom heater can also hang from a ceiling to open up more space in the area. The propane-powered version is portable on a wheeled base and can be moved to serve a wide range of heating needs. With four models on offer, Sunglo can serve the heating needs of nearly any space or occasion. The PSA265 is an excellent choice as a permanent feature as it mounts to a post in the floor. The A242 offers a range of useful options as it is both flexible in its settings and portable. The A270 propane heater is the most portable of the line and can be used in almost any environment. The A244 is designed to be hung, freeing the floor from obstruction and tapping into the natural gas line for maximum reliability. Sunglo heaters are available for purchase with authorized independent dealers.